Thanks Glenn1 Glad you like it. I appreciate you stopping by and leaving a comment. Have a fantastic day! Yes! Thanks for stopping by Carl. Have a great weekend. Why is it official buildings always have great gardens, no matter where you are in the world? That little bird….. I like the symmetry (and how that bird offsets it ever so slightly)! I wonder where its mate was. The bird is perfect and aren’t the flowers gorgeous. Hi Brenda! Glad you like the photo. The bird was a nice, albeit unexpected, touch. Have a wonderful week. That’s beautiful . . . and I don’t generally like wrought iron. Oh wow, wonderful! Glad you like it. 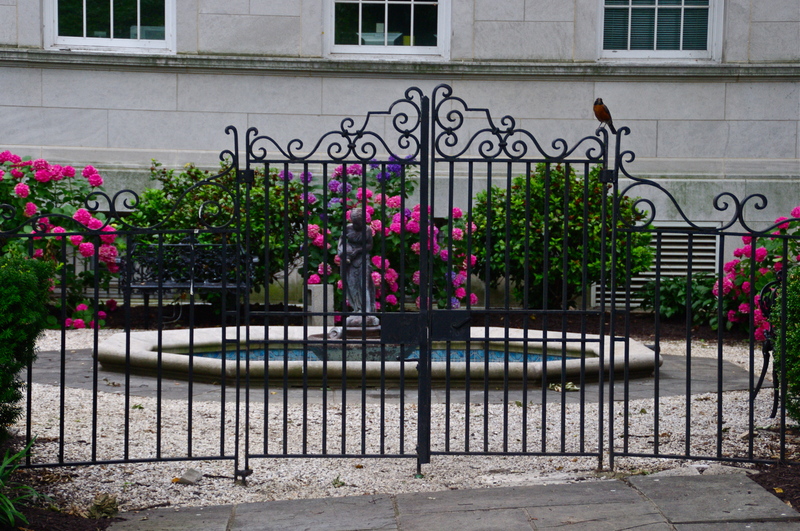 loving the gate with bird on top of it..nice captured photo.. Thanks John. The bird added a nice, albeit unexpected, touch. Thanks for stopping by. Much appreciated. Beautiful well kept entrance. Even the bird doesn’t mind hanging out there. Great job! Bit of.good luck. Lovely pic. Thanks Jessie. Yes, it was a bit of good luck. Glad you like th photo. 🙂 Appreciate you dropping by. Love the bird – how nice of him to make your photo complete. BTW, I added you to my blogroll. Thought I had done it a long time ago and just realized I had not. Yes, it was nice of the bird to cooperate. hahah. And thanks for adding me to your blogroll. That reminds me I have to update mine. I appreciate your support. It all looks so inviting~ I love the flowers and the Guard Bird! Excellent! Thanks Marge. The bird does make a nice, subtle touch, doesn’t it. Glad you like it. Lovely photo Cecelia. The tone, with those wonderful flashes of colour, is perfect! Glad you like it, Patti. The color does make this photo work. Thanks for stopping by. I like the shock of fuchsia and purple flowers. They seem to mock the officiousness of that government building. fThe “shock” of color does make this photo, I agree. Thanks for stopping by. Beautiful. The bird gives the picture a peaceful quality. Thanks gobetween. I agree. Even thought it is small, there is something about that bird that adds a special quality to the photo. Glad you like it. Those dang’d birds get everywhere don’t they 😉 The garden looks colourful. 🙂 Thanks for stopping by, Martin. Yeah,those birds show up when you least expect them! That entrance must be belong to someone filthy rich. Thanks Mizz! This is some government building or embassy in Washington, DC. It is rather oppulent, but beautiful Glad you like it, and thanks for stopping by. It makes me want to walk through those gates to see what’s behind them! The bird is a lovely touch – and a nice surprise when you uploaded the photo! Thanks Doris. Glad you like it. The bird on top of the gate is just a perfect addition to an already beautiful photo. Yes, it was a nice surprise. I’m glad you like it, too. Thanks for stopping by.